Aluminum Sheet: Anodizing - Integral Color (Duranodic) SAF – Southern Aluminum Finishing Co, Inc.
… is a type of anodized finish we no longer offer. 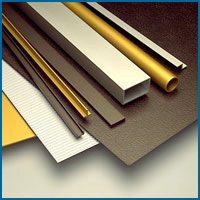 Duranodic is an Alcoa trade name for an electrochemical treatment to aluminum that results in the development of color while protecting against oxidation. It was commonly used in the coloring of aluminum storefront systems. There are many kinds of anodized finishes. Alcoa introduced this process in the early 1960’s and the name remains their trademark as far as is known. Companies employing the process were required to have a license from Alcoa. In the early 1970’s the current 2-step process was introduced as an alternative to Duranodic color. This anodizing process forms corrosion resistant and hard oxide films on aluminium. The process consists of two steps: first the formation of chromate/phosphate treated layer on the surface of aluminium and secondly anodizing in a sulphuric acid solution. The films formed by the 2-step process provides better corrosion resistance and Vickers hardness compared with films formed by Alcoa’s anodizing. Subsequently, Alcoa lost interest in this market presumably because of the increased competition, and the Duranodic became known as “integral color.” Integral color simply means the coloring and anodizing took place in a single step. With 2-step the anodizing takes place in two steps: the aluminum is sulfuric acid anodized before it is electrolytically impregnated with tin salts. At SAF, we perform the 2-step process. For differences between the two process, click here. Southern Aluminum Finishing no longer processes Duranodic anodizing.